Learn how to make dense, chewy, chocolate brownie with a cup in the center. 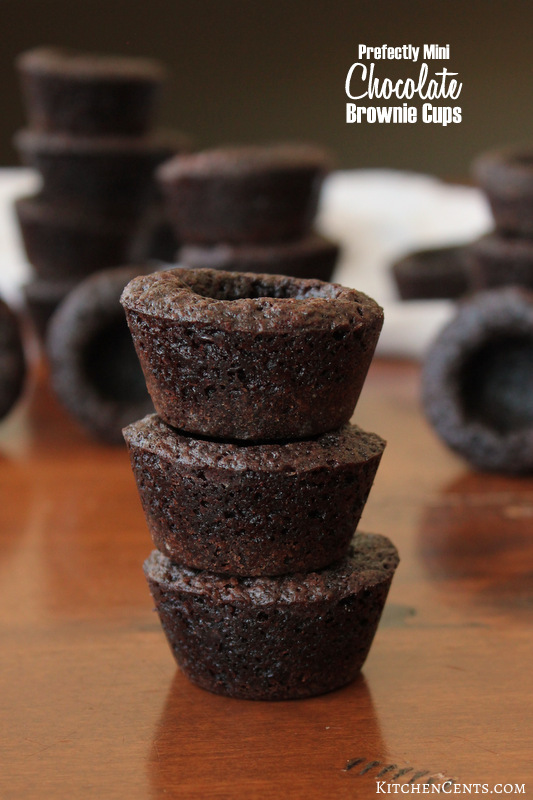 These from-scratch Mini Brownie Cups can be made for any occasion. Fill them with your favorite brownie addition… mint, raspberry or 3-Ingredient Chocolate Mousse, cream cheese icing, caramel, ice cream. The list goes on and on! I love brownies! These mini brownie cups are so good. Choosing the filling for your brownie cups will be the hardest part. Make a batch then fill them with whatever filling you enjoy with your brownie. Mint Mousse, Rasberry Mousse, Chocolate Mousse, caramel sauce, buttercream frosting, cream cheese frosting, strawberries and whipped cream… these are just a few we’ve tried and loved. There are so many possibilities! Picking the filling really is the hardest part. 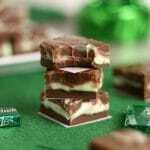 These 2-bite mini brownie cups are great for parties and sharing. We love making a batch then sharing with neighbors and friends. Plus, I don’t feel so guilty when I enjoy two or three of them at a time. Haha. They’re really easy to make. Here’s how I do it. I mix the butter and cocoa powder together then add the sugar and vanilla. Once the sugar and vanilla are mixed I add the eggs. Next, the dry ingredients (flour, salt, and baking powder) are added. I only mix the dry ingredients until they are incorporated. 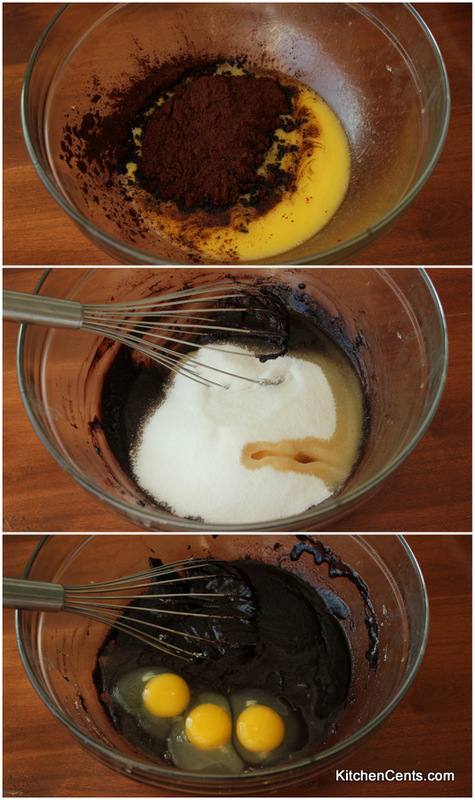 Brownies can go from mixed to overmixed very quickly. So… don’t overmix. Once the batter is mixed I scoop the batter into lightly floured mini muffin tins. I like to use my size 70 scoop which is equivalent to 1 tablespoon. The recipe makes 48 mini brownie bits. I bake mine in 2 mini muffin tins, each holding 24 brownies. Once the pans are filled, bake’em! 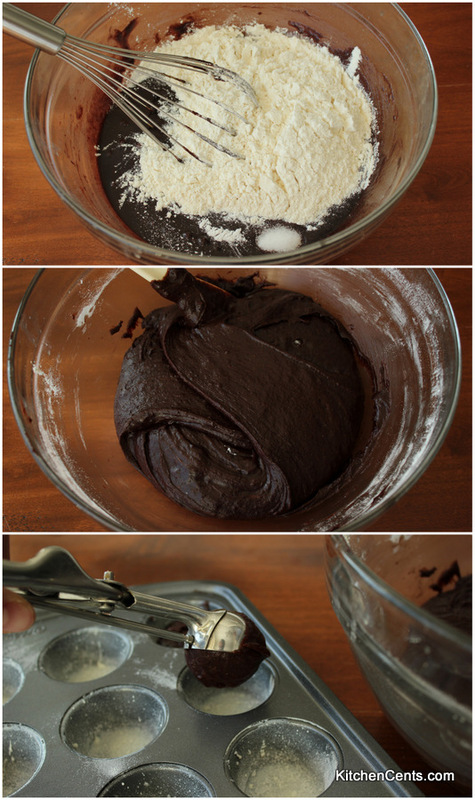 This brownie recipe is fabulous for these because they aren’t overly sweet. These brownie cups come out dense (in a good way), chewy, and has a dark chocolate flavor. It’s the perfect brownie cup to fill with sweet mousse, caramel, ice cream, etc. 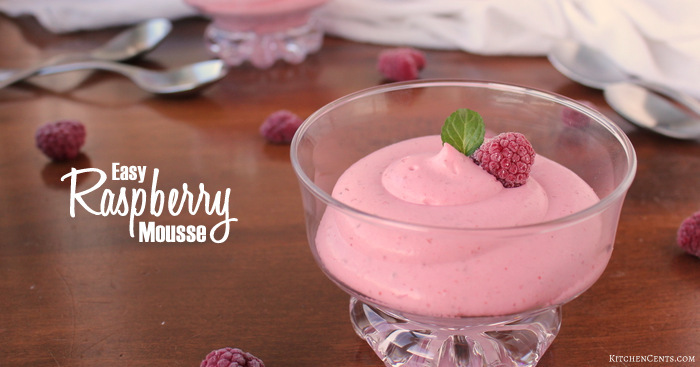 If you’re looking for something light and fruity, this Raspberry Mousse is great. You can find step-by-step directions for the mousse HERE. This mousse is eggless and comes together pretty fast. If you follow the Raspberry Mousse recipe you will only need a half batch. 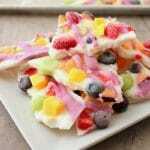 If I were you, I’d make the whole batch and enjoy some mousse by itself or with fruit. Yum! If you’re wanting something a little more rich you could try this homemade Salted Caramel Sauce or peanut butter filling using this Reese’s copycat recipe. After the brownie bits are done baking, I let them cool for about 5 minutes. I use a small fondant rolling pin to make the bowl part. 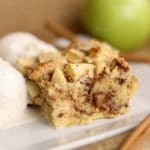 You can use a measuring spoon or get creative with what you have on hand. I pop the brownie cups out of the pan before filling. This helps keep everything clean as sometimes the brownie cups will stick to the pan and if that happens, you don’t want to try to get them out after being filled. Once they’re out of the pan, I let them fully cool before filling. If you’re going to fill them with something warm like a caramel sauce, cooling completely isn’t totally necessary but if filling with a mousse, pudding or ice cream, completely cool is the way to go. That’s it! They are ready for the filling of your choice. I usually put the filling in a ziploc bag, cut a small hold in the corner or use a piping tip to fill them. 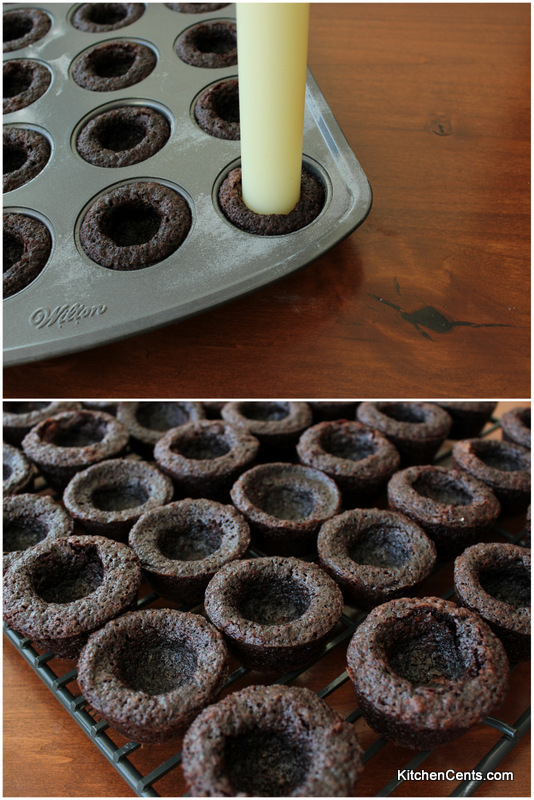 What will you be filling your brownie cups with? 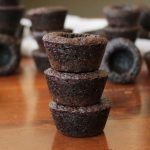 A dense, chewy, chocolate brownie with a cup in the center, these Mini Brownie Cups from scratch can be made for any occasion. Fill with desired filling. Mousses, frostings, caramel, ice cream, etc. Thank you Rachel. I am making little frog ponds. Grandchildren visiting soon and will love these. Oh, how FUN! I’d love to see pictures. 🙂 That sounds like such a cute idea!!! Can these be made in a regular-size muffin tin? Hi Jerry! Yes, this recipe should be fine to be made in a regular-size muffin tin. You’ll need to adjust (increase) the bake time accordingly. I’m guessing you’ll need to bake them an extra 5-10 minutes or until a toothpick poked into the center comes out clean. 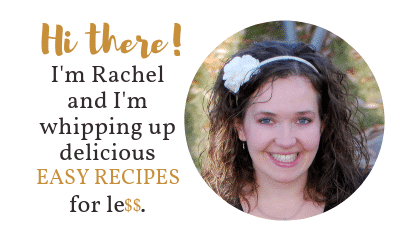 Happy baking and thanks for stopping by! These taste great however they fall apart and we had to cook them much much longer just to get them out. Will make them in paper cups next time. Sooo sorry to hear this Shantel! I wish I knew why they stuck. If you lightly greased and floured the tin they should have released fairly easy. 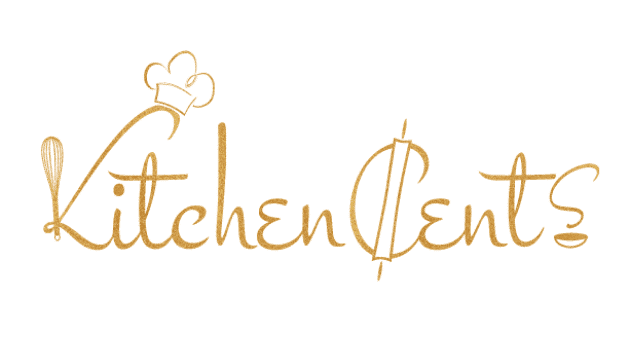 Depending on if you have a gas or electric oven, bake time can vary but usually not by much. I’m so sorry you had a hard time with these. I’m so happy you like the flavor though. They are a family favorite. Fingers crossed for next time.